Don't you just love it when a business or brand totally captures the spirit of what they are selling. 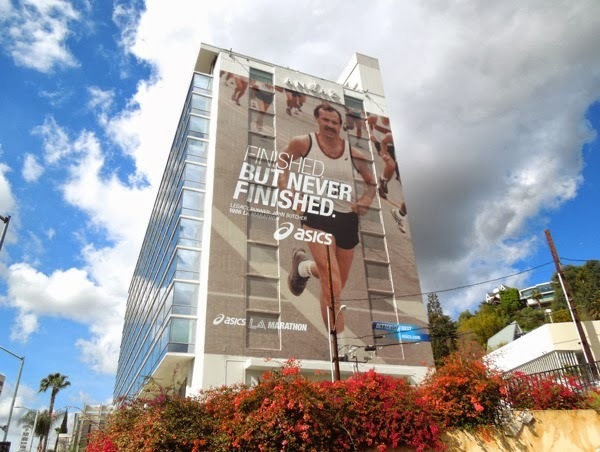 Sports apparel and footwear brand Asics is once again the sponsor of this year's annual L.A. Marathon and participating runners will see these inspirational billboards as they run the scenic 26.2 mile route from Dodger Stadium through Hollywood and down to the Finish Line at the Pacific Ocean in Santa Monica. 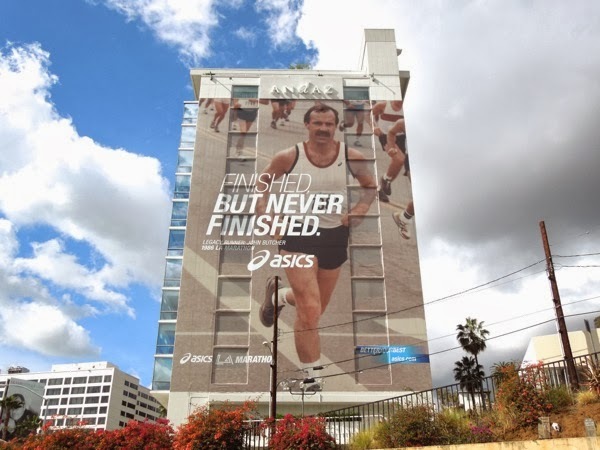 Whether you're a first time marathon participant, or an experienced athlete, these ad creatives will help lift your spirits with their motivational messages and visuals. 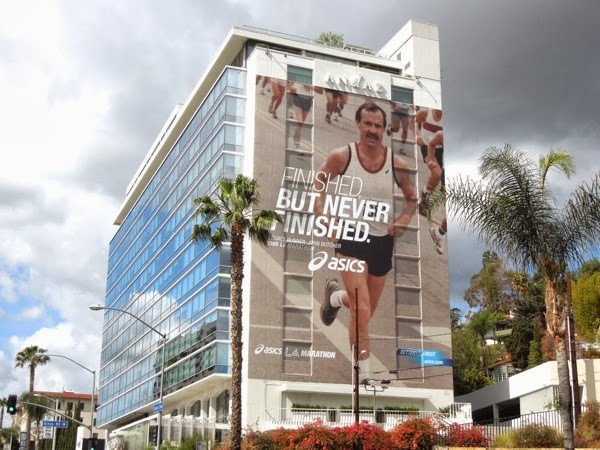 The centerpiece of the ad campaign has to be this giant-sized creative on the westbound side of the Andaz Hotel in West Hollywood, snapped on a stormy February 27, 2014. 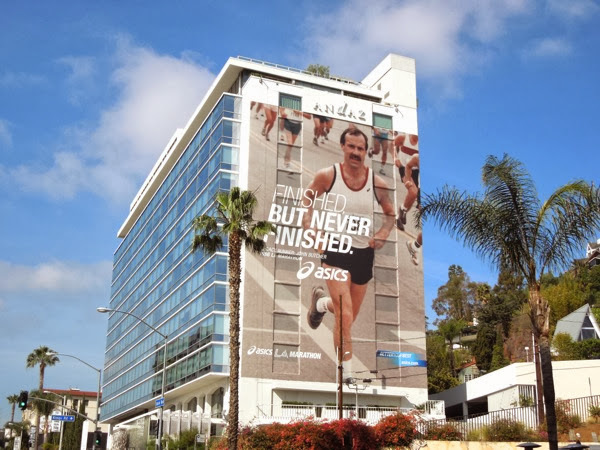 Runners will see this super-sized blast from the past, of Legacy Runner John Butcher from the 1986 L.A. Marathon, in-between miles 13 and 14 along L.A.'s infamous Sunset Strip, as they've completed their first half of the race and are needing a morale boost for the remaining miles - 'Finished. But never finished' indeed. 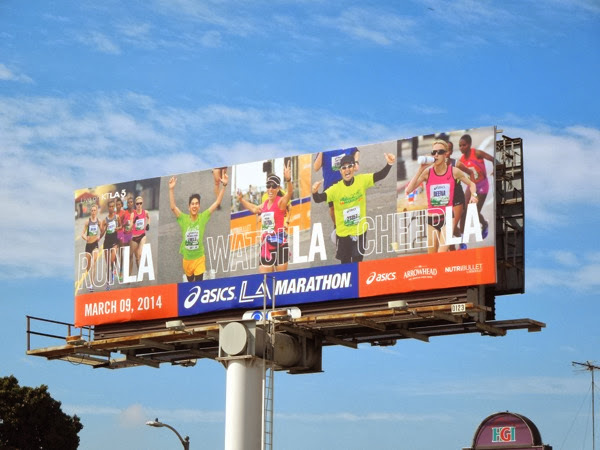 In addition to the billboards strategically placed along the course, there are also billboards encouraging others to come out and watch and cheer the sports event, even if they are not participating (like this one spotted along Sunset Boulevard on March 3), and take it from someone who knows, that support is vital and so appreciated on race day by the marathoners. 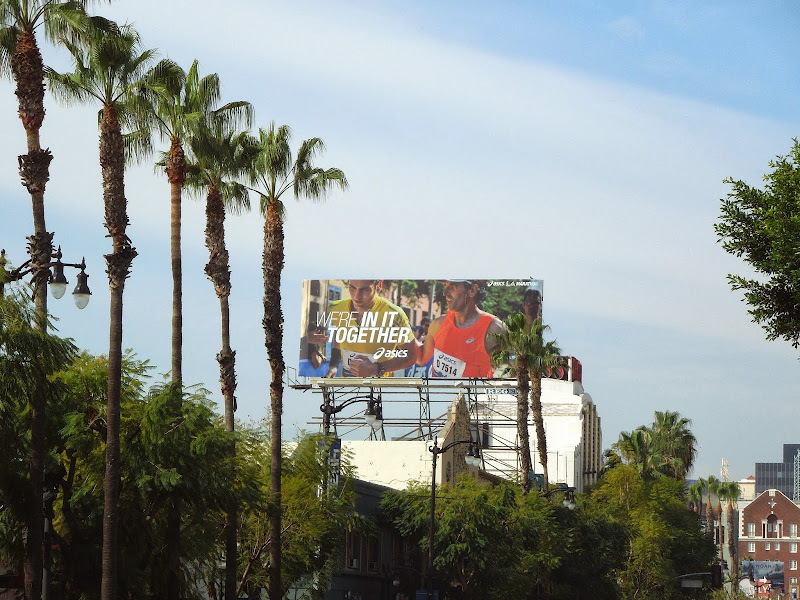 Another billboard spotted on March 5, 2014 along the race route on Hollywood Boulevard, just before the half way mark, sums up the camaraderie of any marathon day, 'We're in it together', whether it be helping a fellow runner in need, or providing support, be it motivational signs, cheers, or food and drink from the sidelines. 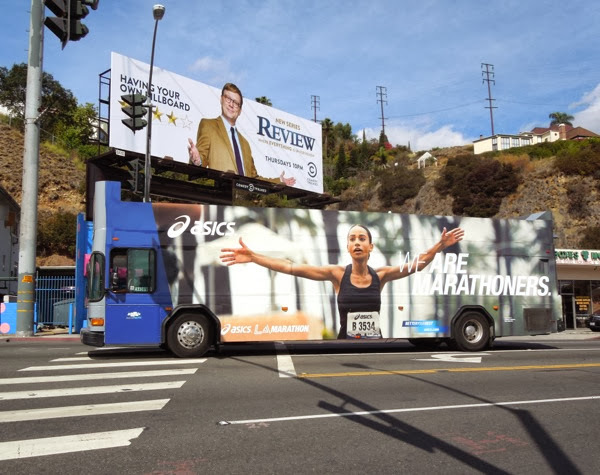 There's a certain magic to race day and these billboards from Asics clearly capture that feeling and Daily Billboard is sure the 20,000 participants will feel the same way as they ran past these ads. Plus in the run up to the L.A. Marathon you know that these creatives may also be an inspiration to those passersby considering running a marathon, or at least putting on their running shoes and going for a jog. 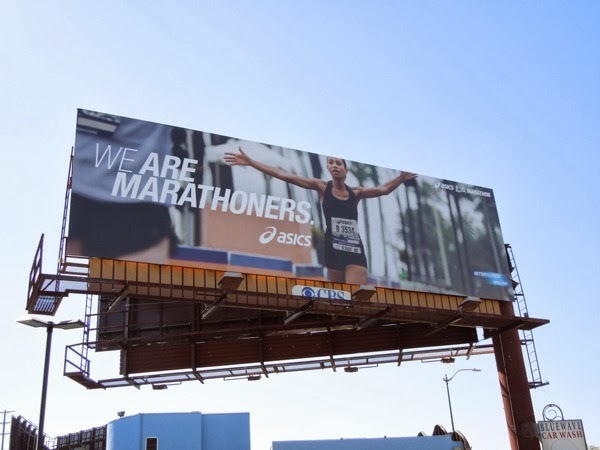 If you like this year's creatives, be sure to check out these inspiring Asics L.A. Marathon billboards from previous years too. 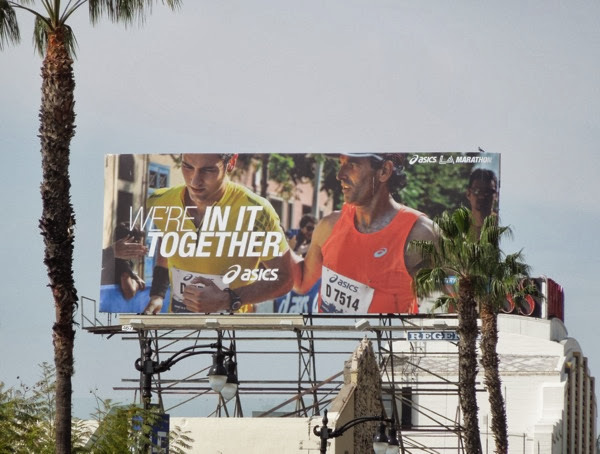 Good luck to everyone running today (Daily Billboard included), we're all marathoners and we certainly are all in it together. 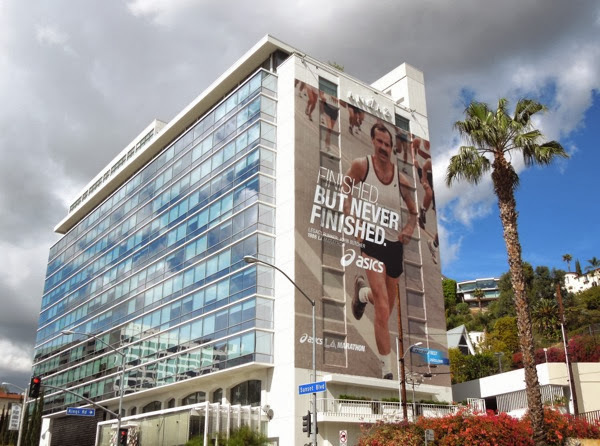 UPDATED: Running the L.A. Marathon on Sunday, which was the hottest race day in a decade, Daily Billboard spotted a few more Asics ad creatives along the marathon route. 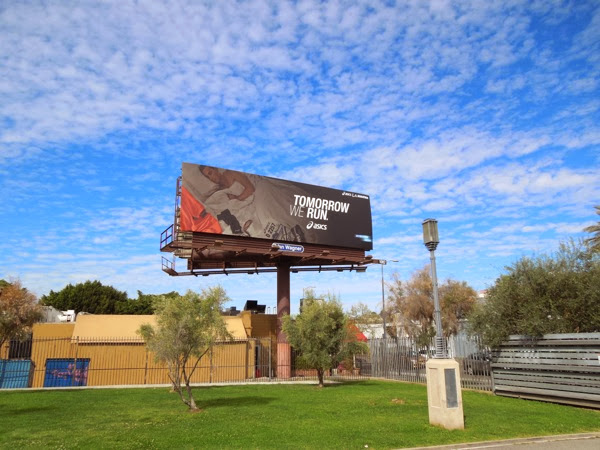 Any runner will appreciate this 'tomorrow we run' billboard spied along Hollywood Boulevard, with all the running gear laid in advance so you don't forget it for your early start on race day. 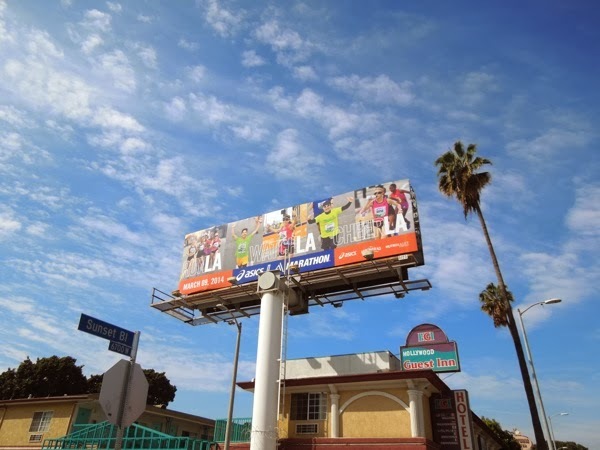 Along the route at Santa Monica Boulevard before Westwood Boulevard there was a billboard version of the bus creative posted earlier, plus here's the giant-sized Legacy Runner creative on a brighter day. 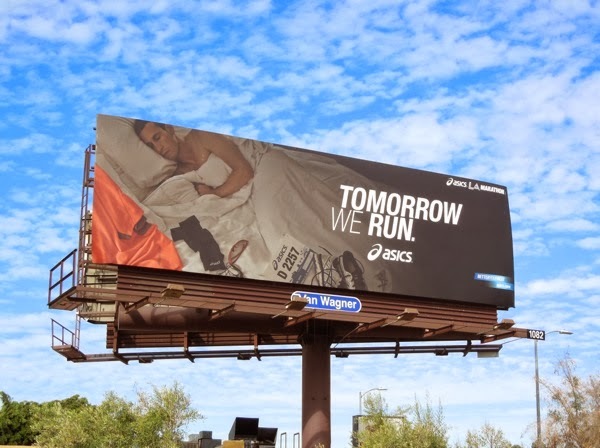 As expected these Asics billboards really did supply a welcome boost during the marathon (it was a tough one) and you can see the ad campaign working in any city as they resonate with any runner whose been through a race day experience. 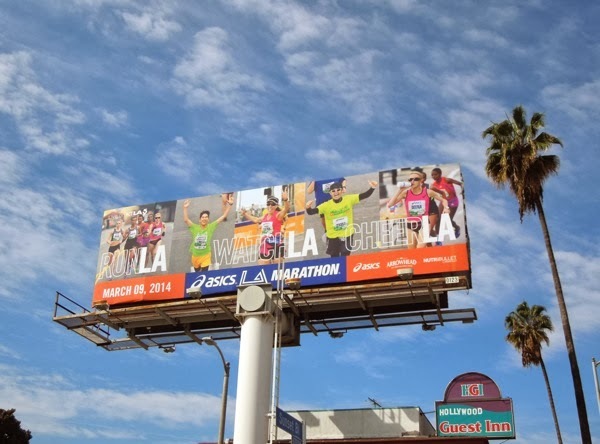 Daily Billboard finished the 'Hellfire' L.A. Marathon in 4:03:25 - the heat beat everyone on race day!